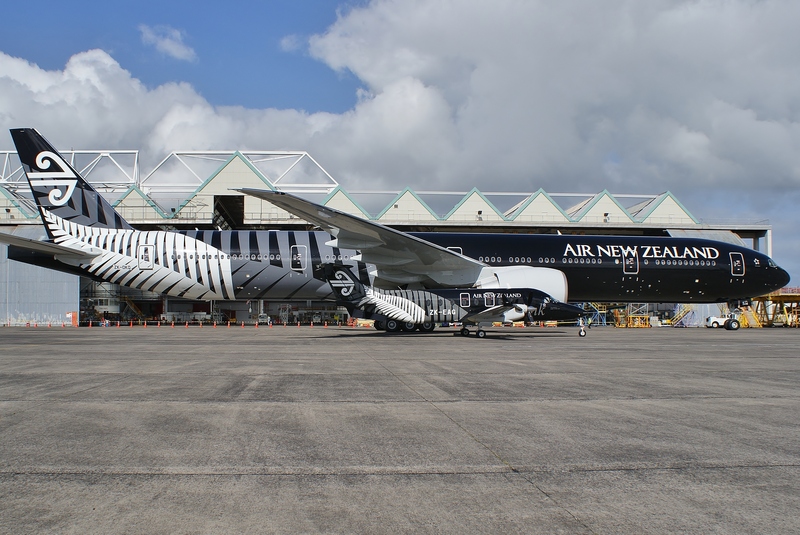 Air New Zealand is the latest airline to revisit and refresh their livery, in a recent flood of new livery designs. Their new livery (as announced earlier today by our antipodean friends at Australian Business Traveller) follows their original idea to change to an all-black tail and typeface treatment, something that they originally announced last year, however the original concept was a lot plainer than what has been produced here today. 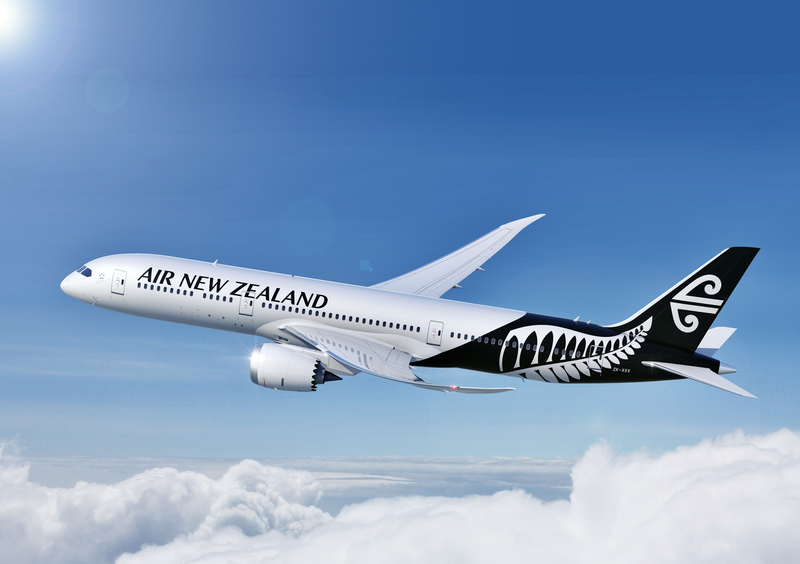 The new aircraft livery will feature the iconic official New Zealand Fern Mark, the use of which is managed by Tourism New Zealand and New Zealand Trade and Enterprise. The simplistic black and white livery (which is reversed on a few key aircraft in aid to still support the All-Blacks national team, as per their incumbent design) is actually a beautiful and simplistic design, which bold mono-chromatic concept is stronger than the aqua colours previously used – and now sits perfectly with the muted interior design palette of the airlines new cabin products. It’s also a nationalistic design, black being the national colour of New Zealand. The mid frame divide between the black and white seems perfectly balanced on this 787-9 model, and hopefully the same diligence and care will be used across the rest of the fleet to keep the balance based on aesthetics rather than a simple formulae. The Air New Zealand ‘Koru’ logo is still prominent but is outweighed by the new fern logo, giving the impression that both logos work in harmony, and neither is more important than the other. A clever branding exercise, giving both the national identity of the airline and the brand of the airline equal strength. Speaking to many Kiwis, the airline is a national symbol and is seen with great pride. The new design will be rolled out over the next year. A Shift to National Pride. This new design seems to have followed a wave in the Pacific Rim of new liveries, each one showcasing their national roots. 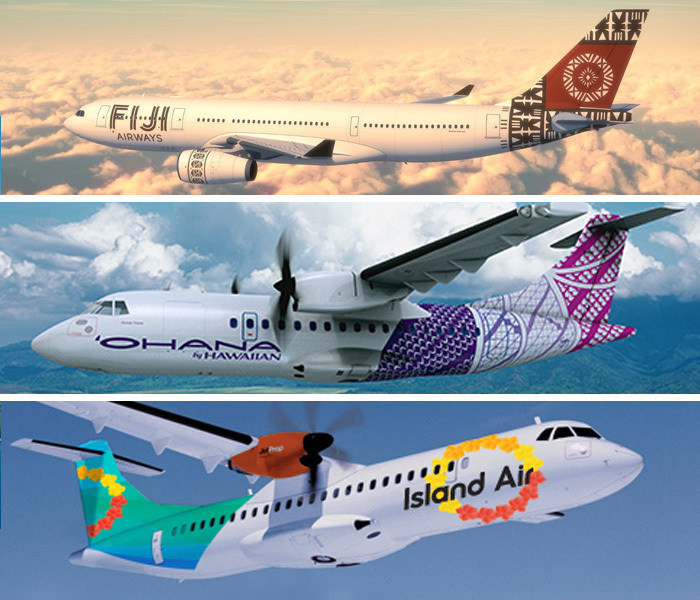 O’hana, Fiji Airways, Island Air and American (along with already national Hawaiian Air whose expanding presence could be claimed as a new brand shift in the Pacific) all announced their new liveries in the last 12 months, each with a distinct shift into their cultural past to produce original and emotional designs that impart the character of their country. The connection between brand and passenger seems to be heightened in the Pacific area, where so many smaller principalities are vying on routes for new passengers. Could this be a rebound from the generalisation of air travel over the past few years, where product and brand have slowly become indistinguishable from each other through cost cutting, and the start of a new era of National pride of their carriers? It seems that passengers are becoming more savvy to choice, and with sites such as Expedia, airlines that we hadn’t even considered before are now cropping up in search engines. These less obvious choices need to showcase that they can offer something other airlines cannot, and brand is key in imparting this information. Heritage and cultural sensitivity seem to be the keywords in successful conversions, more passengers feeling a desire to support local business. We love this new direction these airlines are taking, and currently all eyes are turning to the Pacific, where it seems originality, flair and design are still alive and thriving. Air New Zealand have always been proud of their roots, already working with campaigns such as Lord of the Rings. This shift to an even more cultural look isn’t suprising, but it’s treatment is excellent and beautifully crafted. Now, even more, is the time to fly with Air New Zealand. Very simplistic analysis. This is an airline clumsily adopting the logo of several government departments in its livery. the thing is just slapped on the back of the plane with no integration into the shape of the vehicle or the rest of the livery. And the black… it is a colour of sporting team, NOT of the country as a whole. I’ve yet to meet any fellow Kiwi who believes black is our “national colour”. I have to disagree with the above comment. 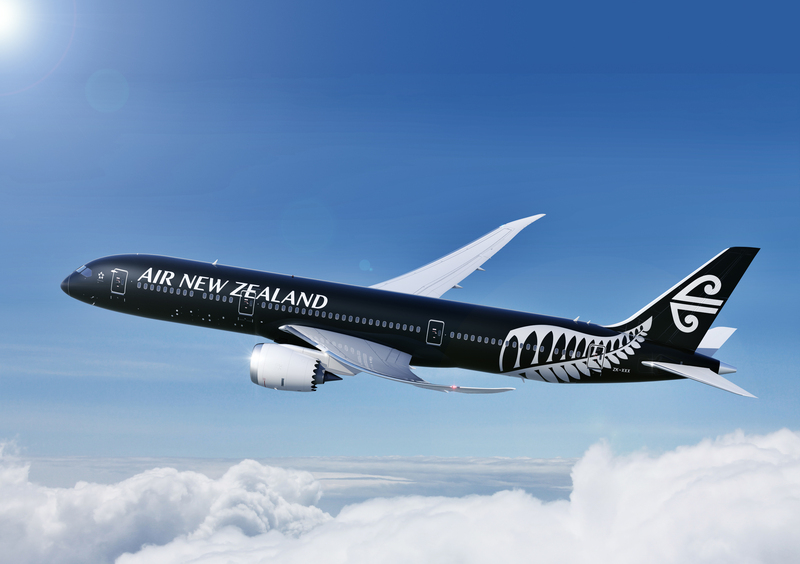 I love the look of the plane and I have never met a Kiwi who does not associate the colour ‘black’ with NZ. Time to change the flag while we are at it! It’s been a few months and I would have to agree with TimE – this colour scheme still doesn’t site right with me. The white space on the left hand side of the fern logo is visually distracting (esp on the white variation), it reduces the impact of the Koru, and black does look dull for an airline that is supposed to represent the nation. Time for AirNZ to ditch the All Blacks association and start representing ALL New Zealanders again. I would agree with Brunol…………………..represent ALL New Zealanders!